Safelink is our patented FM digital technology that provides the maximum protection against false activation of the receiver collar caused by stray radio signals. DogWatch is the most secure invisible fence system available. Safelink is 15 times faster than any AM pet fence which means no dog can out run the FM signal. Why use FM? – Security! The Police, Fire Brigade and Ambulance service all use FM as the FM digital signal ensures that no interference is received. An easy comparison is tuning your radio to an AM radio station, you will receive interference from other users on similar channels. This can be the same with the invisible dog fence. In order to keep your pet safe from a stray activation of the collar DogWatch hidden fence systems use our patented FM technology – Safelink. Many household appliances including televisions, wi-fi, computer monitors, light dimmers, motors etc emit a noise based signal that AM receivers “hear” and incorrectly acknowledge as their own signal, triggering an unwanted response. FM receivers only “hear” their own transmission. AM receivers can be confused and accidentally trigger as the receiver assumes the signal is correct. Many AM systems use two signals to try to alleviate the problem but this slows the reaction time down on both the start up and shut off time on the receiver – this is why dogs and cats can “out run” the signal on AM systems and also continue to be corrected when they are out of the zone. The FM signal is quick and accurate and will always react when the dog enters the zone but also, and very importantly, will shut off immediately when the pet exits the zone back into the safe area. Only one dog fence system runs on FM – DogWatch – other companies may try to cover the fact that they use AM by stating – Digital Modulation or Magnetism. All dog fence systems in today’s market should use DM (digital modulation) and all dog fences since their introduction over 30 years ago create an electromagnetic field (often referred to as magnetism). However DogWatch systems DO NOT USE OOK (ON/OFF KEYING). OOK (ON/OFF KEYING) is a system used by AM companies. It was originally introduced to save energy, however, with DogWatch our systems are both fast and energy efficient. Most transmitted signals have ON and OFF periods, except for DogWatch. All other hidden fence systems use pulsed AM signal. Each company has their own pattern but all have ON and OFF times. The more time that the signal is OFF, the more time there is available for an interfering signal from another system to “get through” to the receiver, disrupting the pattern and causing the receiver to miss the total signal – leaving the receiver “deaf and dumb” – your dog does not receive the activation. The maximum time that any AM system is in the ON position is 50%, some systems have only a 13% ON time. All the OFF time is open for the receiver to “hear” something else and if another signal is around the system can easily become desensitized. Missing the signal is a separate issue from false activation. False activation is due to the fact that AM receivers do NOT ignore all noise based signals. FACT: FM is safer and quicker than AM! Ignores electrical noise sourced (televisions, computer monitors, light dimmers, motors, etc. are AM). FM receivers ignore AM signals. FM receivers can work in electrical noise environment. Can be used near or against electrical appliances and cables. Can be attached to metal or stock fencing without loss of signal. Below is a technical explanation produced by the The Columbia Electronic Encyclopaedia of the difference between AM & FM. For the propagation and interception of radio waves, a transmitter and receiver are employed. A radio wave acts as a carrier of information-bearing signals; the information may be encoded directly on the wave by periodically interrupting its transmission (as in dot-and-dash telegraphy) or impressed on it by a process called modulation. The actual information in a modulated signal is contained in its sidebands, or frequencies added to the carrier wave, rather than in the carrier wave itself. 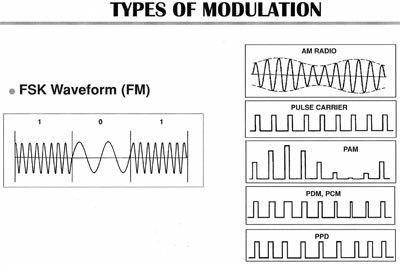 The two most common types of modulation used in radio are amplitude modulation (AM) and frequency modulation (FM). Frequency modulation minimizes noise and provides greater fidelity than amplitude modulation, which is the older method of broadcasting. Both AM and FM are analog transmission systems, that is, they process sounds into continuously varying patterns of electrical signals which resemble sound waves. Digital radio uses a transmission system in which the signals propagate as discrete voltage pulses, that is, as patterns of numbers; before transmission, an analog audio signal is converted into a digital signal, which may be transmitted in the AM or FM frequency range. A digital radio broadcast offers compact-disc-quality reception and reproduction on the FM band and FM-quality reception and reproduction on the AM band. In its most common form, radio is used for the transmission of sounds and pictures. The sounds and images are converted into electrical signals by a microphone or video camera, amplified, and used to modulate a carrier wave that has been generated by an oscillator circuit in a transmitter. The modulated carrier is also amplified, then applied to an antenna that converts the electrical signals to electromagnetic waves for radiation into space. Such waves radiate at the speed of light and are transmitted not only by line of sight but also by deflection from the ionosphere. There are certain differences between AM and FM receivers. In an AM transmission the carrier wave is constant in frequency and varies in amplitude (strength) according to the sounds present at the microphone; in FM the carrier is constant in amplitude and varies in frequency. Because the noise that affects radio signals is partly, but not completely, manifested in amplitude variations, wideband FM receivers are inherently less sensitive to noise. In an FM receiver, the limiter and discriminator stages are circuits that respond solely to changes in frequency. The other stages of the FM receiver are similar to those of the AM receiver but require more care in design and assembly to make full use of FM’s advantages. FM is also used in television sound systems.